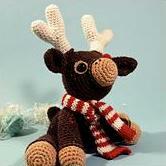 This adorable Christmas reindeer pattern is by the very talented Dawn Toussaint. I'm planning to have one finished in time to decorate this year! What a lovely Reindeer, Thank you so much for sharing the pattern. You'd have to contact the actual designer to get permission. Thanks for this one! It was too cute not to make!